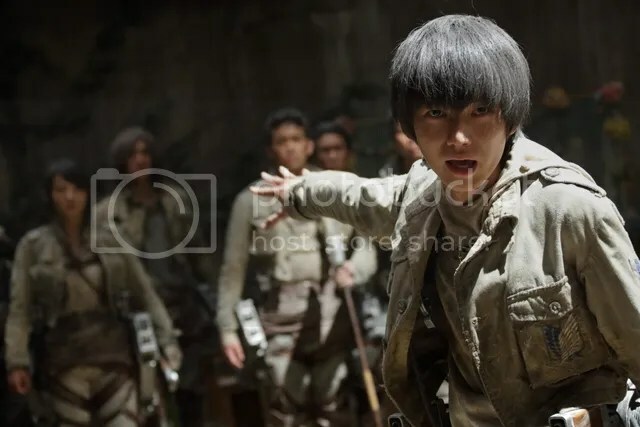 Adapted from the hit manga series written and illustrated by Isayama Hajime, Attack on Titan is an “extreme scale” live-action movie that has created intense hype even before its release. The 16 volume manga series which sold more than 50 million copies worldwide is set to hit Singapore’s cinema on 13 August. This dark fantasy is set in an apocalyptic world where humanity is caged behind enormous walls as a defence against the Titans, gigantic humanoid creatures that devour humans. 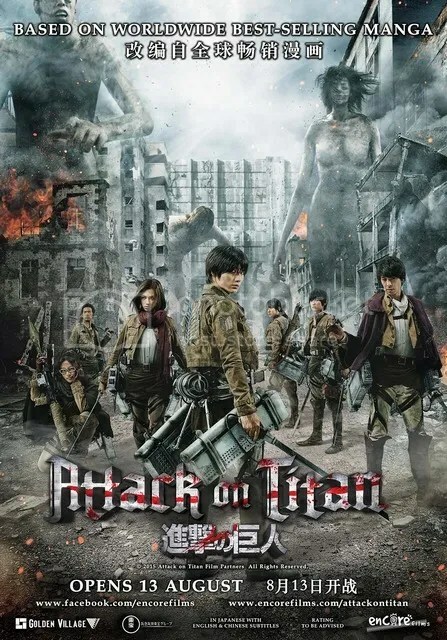 Attack on Titan stars a list of notable actors including Miura Haruma (Koizora/ Sky of Love), Hiroki Hasegawa (Suzuki Sensei), and Kiko Mizuhara (Norwegian Wood). The story centres around Eren Yeager and his friends Mikasa and Armin. 100 years ago, mankind was almost wiped out by giant humanoid creatures, known as the Titans, who devour humans. To defend themselves against the Titans, the survivors forged massive walls and since then, all of humanity has been enclosed within the walls. The survivors found peace and refuge within the confines of the wall, however, these came at the expense of freedom. Generations of human kind thereafter never had a chance to venture beyond those walls and the existence of Titans gradually became a myth. That was until the walls were destroyed by a colossal Titan. Countless Titans followed soon after, smashing through the walls and destroying (and consuming) everything in their path. Vowing revenge and to reclaim their homeland from the Titans, protagonist Eren and his friend join the Survey Corps to fight the Titans. Overall, the movie had been a tad disappointing for an avid AOT supporter like me. What I found the movie lacking in was the the development of the characters: **SPOILER ALERT** they messed up the backstories of the leading characters pretty badly, and also, you’ll find yourself missing a certain character for a good half of the movie. However, in the aspects that the movie has not done so well in, it made up for it with its CGI. 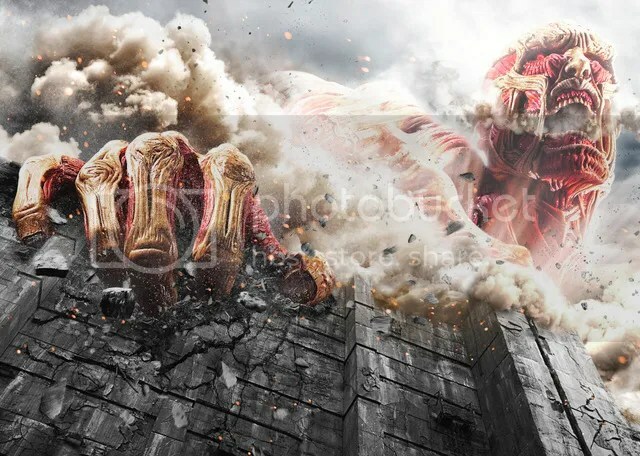 As expected from the trailers, the colossal Titan looked magnificent. The other Titans were depicted really accurately too, which made the scene of them rampaging through the town and devouring humans a little harder to stomach than the anime… The visuals were so real, and watching it was quite a cringe-inducing experience (in a good way! kudos to the team behind this). For me, I felt that the Attack on Titan anime overshadowed the live-action. My experience with Attack on Titan live-action was similar to another anime-turned-movie, Kuroshitsuji, where I was dumbfounded by the many plot-twists in the show having been accustomed to the anime version. However, the live-action version of Attack on Titan cuts real close. Even with the plot changes, I found myself immersed in the movie from the beginning to the end. Although I wished the movie stuck closely to the original anime/manga, I felt that the changes made were dramatically intriguing and these are factors that could potentially make for juicy bits in the follow-up of the movie franchise. When the credits started rolling and the cinema’s lights started to switch on, I was hungry for more. I cannot wait for part 2 of the movie to be out! A note to my fellow AOT fans: walk into the cinema without carrying any expectations for the movie and you might find yourself pleasantly surprised! The Fifth Parlour would like to thank Encore Films for the invitation to the media screening of Attack on Titan live-action movie.